What is the Japanese National Anthem? Learn it Now! With the Tokyo Summer Olympics coming up in 2020, you’re no doubt going to be hearing the Japanese national anthem a lot. If you’re like me and live outside of Japan, then you’re probably not very familiar with it. Just what is the Japanese national anthem? The name of Japan’s national anthem is 君が代 (きみ　が　よ) which translates as “His Imperial Majesty’s Reign” in English. It gets played at the kinds of events that you would expect, such as graduation ceremonies, sporting events, etc. If you can read sheet music, then you’ll be able to play it from the featured picture at the top of this post. But if not, then you’ll want to check out the YouTube video below along with the translation provided for the lyrics. The common protocol is to stand facing the 日の丸 (ひ　の　まる), the Flag of Japan, and to sing along with everyone else. Do you enjoy learning Japanese through songs? Kimi Ga Yo is one that all Japanese people know, so you can certainly sing along when it’s played. I even knew a guy who liked to sing anthems in karaoke. Is that weird? Who knows, if Japan does really well in these upcoming Summer Olympics, you will probably learn this song without even trying! One of the things you’ll notice right away about the song is how short it is when compared to other national anthems. In fact, Kimi Ga Yo is one of the shortest national anthems that exists. Something that you might not be able to tell just from hearing it though is that, according to Wikipedia, the lyrics for Kimi Ga Yo are the oldest for any current national anthem! The line “until the pebbles grow into boulders” is in reference to 細石 (さざれ　いし) which are large boulders like the one in the picture below. These are stones that, according to legend, grew from small pebbles. Rocks that grow, hmm…. It kind of reminds you of the Pokemon Graveler, doesn’t it? Another interesting thing about Kimi Ga Yo is that the current melody for the song wasn’t the original one. The first version was presented to the emperor in 1870, but just a short 10 years later it was changed as the ruling bodies we not pleased with how it sounded. 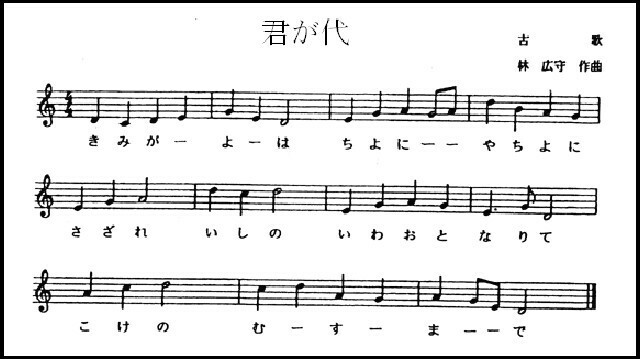 And finally, in case you were wondering, the Japanese word for national anthem is 国歌 (こっか) which is of course a compound word created from the kanji for both country and song. The “Japanese National Anthem” would then be 日本国歌 (にほん　こっか) . Have you heard Japan’s national anthem before? Perhaps on TV during the last Olympics, or even during your stay in Japan? Let me know your experience with a comment below! I imagine we’re going to be hearing this 国歌 quite in bit in 2020. Haha! Yeah there is always a lot of extra incentive to win when it’s your own home turf.